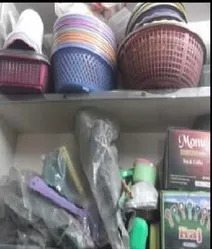 Based out at Delhi, we "Monu Plastic" are the popular manufacturer and exporter of fine quality Plastic Strainer, Plastic Hand Fans, Plastic Dust Pan, Plastic Masala Box, etc. Our product range is of superior quality, high durability, light weight, break-resistant with vibrant colors, innovative designs and smooth finishing. Our manufacturing brand is Monu. Under the guidance of our mentor Mr. Pawan Garg, we have gained a huge expertise in this domain. Our organization is backed by a diligent team of professionals with rich industry experience. The combined and persistent efforts of our designers, engineers, technicians, quality controllers and sales &marketing professionals has fetched us a notable position in the market. With the in-depth knowledge in their respective domains, our team helps us produce an excellent range of plastic house ware. We conduct regular trainings for our team to keep them abreast with latest technology and market trends.